Both Bosch and Mitsubishi starters are permanent-magnet type. A planetary gear train transmits power between starter motor and pinion shaft. Both starters are 12-volt units with solenoid mounted on starter housing. Excessive distance between pinion gear and flywheel/drive plate gear. Shim starter motor toward flywheel/ drive plate. Very high frequency whine after engine starts with ignition key released, engine starts okay. Insufficient distance between starter motor pinion gear & flywheel/ drive plate runout can cause noise to be intermittent. Shim starter away from flywheel/drive plate. Check flywheel drive plate for bent, unusual wear, and excess runout. Replace flywheel/ drive plate as needed. A loud "whoop" after engine starts while starter motor is engaged. Most probably cause is defective overrun clutch. Overrun clutch replacement normally corrects this condition. Replace overrun clutch or drive assembly. A "Rumble, " "Growl," or "Knock" as starter motor coasts to stop after engine starts. Most probably cause is, bent or unbalanced starter motor armature. Armature replacement normally corrects this condition. NOTE: Ensure battery is fully charged. A cold engine increases starter draw amperage. and connect remote starter switch to starter relay. Set voltmeter selector to 18-volt position. Adjust ammeter reading to zero. 2) Disconnect coil wire from distributor cap. Attach coil wire to ground to prevent engine from starting. Crank engine, and note cranking voltage and amperage. Replace or repair starter if it is not to specifications. See appropriate STARTER SPECIFICATIONS. Remove starter relay from Power Distribution Center (PDC). 87A. If no continuity exists, replace relay. See Fig. 1.
resistance is not 70-80 ohms, replace starter relay. Fig. 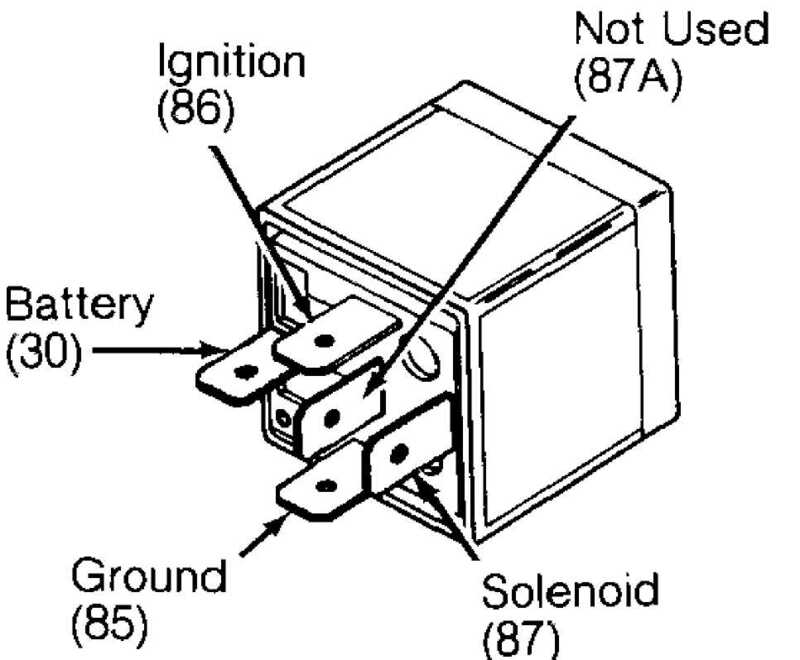 1: Identifying Starter Relay Terminals Courtesy of Chrysler Corp.
either test, solenoid has open circuit. Replace solenoid. starter relay. If engine cranks, solenoid is okay. necessary. If engine still does not crank, repair or replace starter. Place armature in a growler. While rotating armature slowly, hold growler’s blade parallel to and touching armature core. Blade vibrates if armature is shorted. Replace shorted armature. Fig. 2: Testing Starter Armature For Ground Courtesy of Chrysler Corp. Using growler or a self-powered test light, touch one lead to armature shaft and other lead to each commutator bar. See Fig. 2. If light glows at any point during procedure, armature is grounded. Replace grounded armature. While holding drive clutch housing, rotate pinion. Drive pinion should rotate smoothly in only one direction (pinion should engage and lock in opposite direction). If drive unit does not operate properly or if pinion is worn or burred, replace drive clutch. 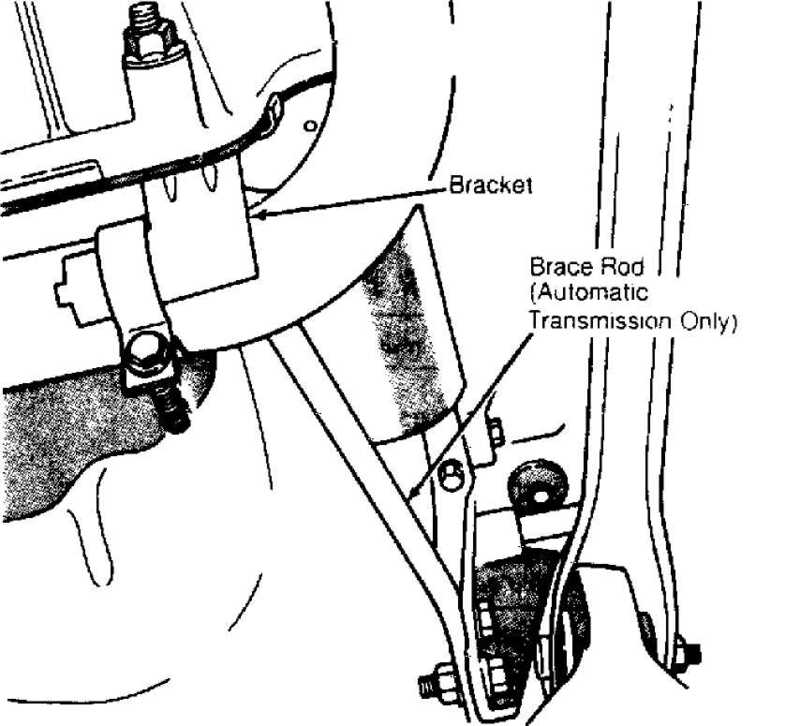 transmission, remove nut and bolt from forward end of brace rod. Remove brace rod and bracket. Fig. 3: Removing Engine Exhaust Clamp & Brace (2.5L) Courtesy of Chrysler Corp. Disconnect negative battery cable. Raise and support vehicle. Disconnect starter battery cable and solenoid feed wire. Remove starter from flywheel housing. To install, reverse removal procedure. NOTE: For exploded views of starters, see Figs. 4 and 5. Fig. 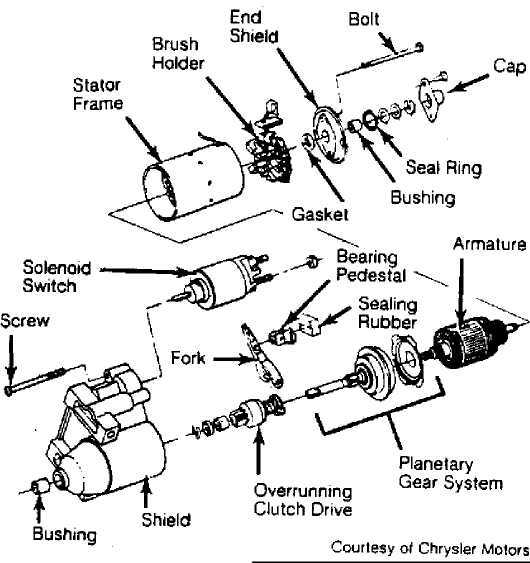 4: Exploded View Of Mitsubishi Starter (4.0L) Courtesy of Chrysler Corp. Fig. 5: Exploded View Of Bosch Starter (2.5L) Courtesy of Chrysler Corp.